It's Potluck week at I Heart Cooking Clubs. 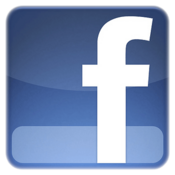 We can cook any recipes from any of the 19 chefs previously featured at IHCC. I've made Tessa Kiros's simple, easy and delicious potato side dish. I always have potatoes in my pantry basket. We love potatoes, any way they are cooked. Baked, roast, boiled, braised, mashed, fried, these humble potatoes would be the first ones to disappear most of the time. 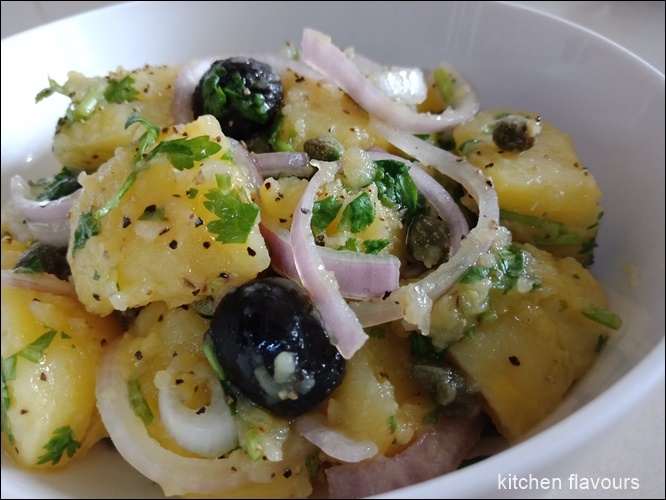 This easy and simple potato salad makes a great dish to any meal. We had the salad with some fried chicken drumettes and broccoli. Yum! Put the onion in a small bowl and cover with cold water and the salt. Leave for 30 minutes or so (while you prepare the potatoes). The soaking is important and will give your onions a softer taste in the finished dish and make them ore digestible. Scrub the potatoes and boil in salted water for about 20-25 minutes until they are cooked but not falling apart. Drain well, then peel them when they have cooled a little - it is easier to do this if they are still warm. Cut them into chunks the size that you would like to see in your salad bowl. Rinse the onion and drain well, patting it dry with kitchen paper if necessary. Add to the potato with the remaining ingredients, seasoning with pepper and probably with a little extra salt. Mix through gently and serve warm or at room temperature. If you make this in advance, the potatoes will soak up some of the oil as they cool, so you will have less dressing. You could save a little of the oil and add it closer to the serving time, if more is needed. 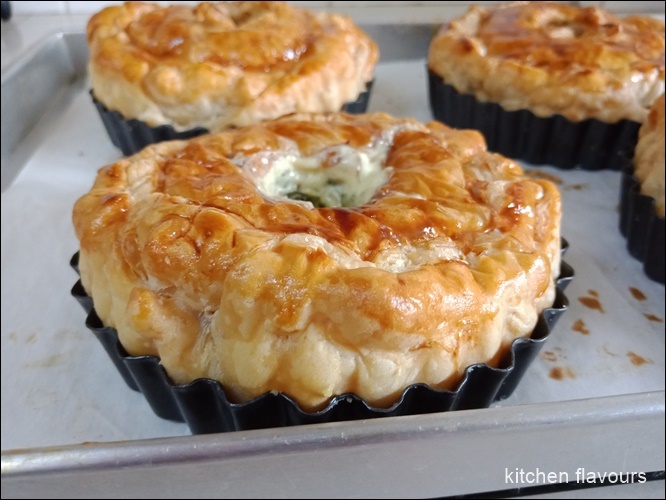 It's April Showers week at I Heart Cooking Clubs (IHCC), dishes to enjoy on rainy days. I was reading through his recipe, and thought how easy it is! Cook in one pot! With only a few ingredients. How tasty can it be? To cook this dish, using an oven safe pot, saute sliced onion in some oil till softens, about 6 to 8 minutes, then add chopped garlic, rosemary, salt and pepper. Stir for a further 5 minutes or so, then stir in the red lentils and stock. Season the chicken pieces with some salt and pepper, then place them skin side up, on top of the lentils mixture, and place the pot in the preheated oven, uncovered, for about 1 hour until the chicken is cooked through and the skin has browned. I baked the dish for 1 hour 15 minutes, the last five minutes with the broiler on, just to brown the skin a little more. 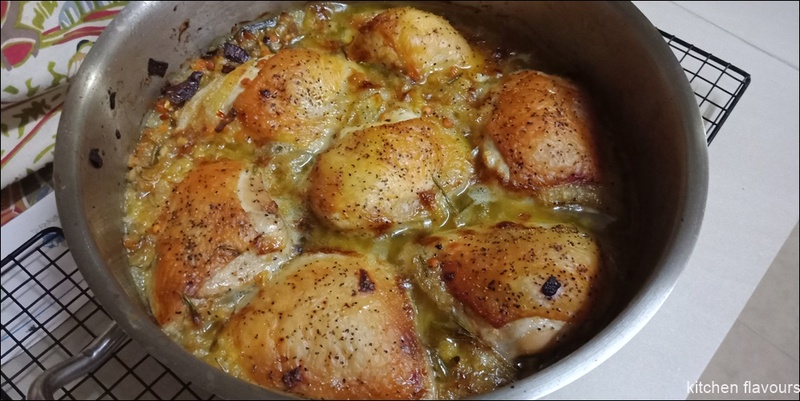 The chicken is moist, tender and so delicious ! The red lentils turned yellow upon cooking, became soft, mushy and so tasty. We had this dish with rice and some stir-fry french beans. We really enjoyed this dish! There were no leftovers! So delicious! Yum! Coincidentally, it started to rain when we had this at dinner time. I did not see that coming, as it was blasting hot and humid the whole day! Preheat the oven to 180C/Gas 4. Choose a flameproof casserole dish or a wide, ovenproof pan that will hold all the chicken pieces snugly but comfortably. Put the casserole on a medium-low heat. Add the oil, then the onion and cook, stirring regularly, for 6-8 minutes until it begins to soften. Add the garlic, rosemary and some salt and pepper. Cook gently for a further 5 minutes, then stir in the lentils and stock. Season the chicken thighs and place skin side up in the casserole. You want most of the chicken skin to remain exposed above the liquid in the dish so it can brown in the oven. Bring to a simmer on the hob, then transfer to the oven and bake, uncovered, for 1 hour. Check that the chicken is cooked through and the lentils are soft. If not, return to the oven for 10-15 minutes and test again. Skim off any excess fat from the surface. Taste the lentilly liquor and add more salt or pepper if needed. 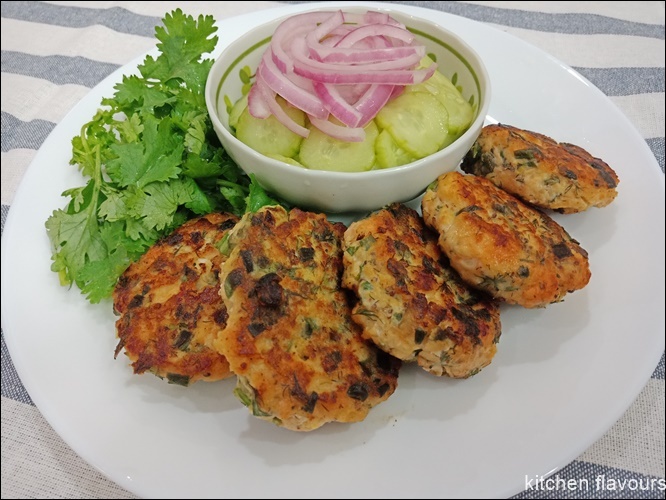 Serve, scattered with chopped parsley, just as it is or with steamed broccoli or spring greens on the side. 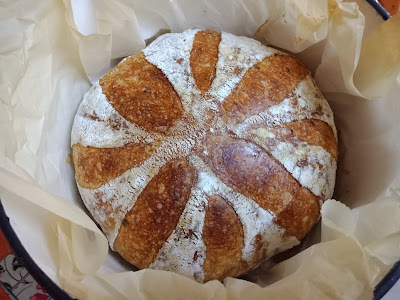 After a twelve months break from cooking with the lovely ladies at I Heart Cooking Clubs (IHCC), I'm back, and hopefully I will be posting more often, as I have not been blogging as frequently as I used to. IHCC cooks with a selected chef every six months, but for this time round, there will not be any new chef selected. It is IHCC's ten years anniversary, and they are welcoming back all of the 19 chefs that were featured for the last ten years ; Nigella Lawson, Mark Bittman, Giada de Laurentiis, Jamie Oliver, Tessa Kiros, Rick Bayless, Madhur Jaffrey, Yotam Ottolenghi, Donna Hay, Nigel Slater, Diana Henry, Jacques Pepin, Ellie Krieger, Curtis Stone, Heidi Swanson, Hugh-Fearnley Whittingstall, Ina Garten, Eric Rupert, and Ruth Reichl. Pretty impressive list of chefs! I've just received two new addition to my cookbooks (yay!) Essential Pepin by Jacques Pepin, and Provence To Pondicherry by Tessa Kiros. So many recipes I want to try! For a start, I made two easy recipes from Jacques Pepin, Sauteed Potatoes with Parsley and Garlic, and Romaine with Creamy Yoghurt Dressing. Easy and quick, makes a nice side dish. Chopped potatoes are stir-fried in oil until cooked and brown all over. Parsley leaves (I've used fresh cilantro), and a few cloves of garlic are chopped together until finely minced. These are added to the cooked potatoes in the pan, tossing to combine and season with salt and black pepper. I could eat this on it's own! I like this yoghurt dressing, it is light, creamy, cool and refreshing, just as Jacques Pepin says. I've used my own homemade yoghurt. Whisk the yoghurt together with white wine vinegar, salt, black pepper until combine, then whisk in the olive oil. Drizzle over the romaine and toss just before serving. 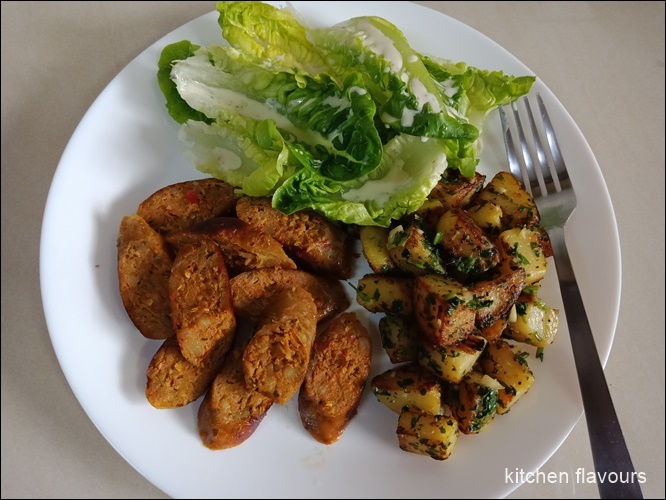 Both the Sauteed Potatoes and the Romaine are served alongside some Spicy Pork Sausages. Cut the potatoes into 3/8-inch cubes. Put in a sieve and rinse well under cool water. Transfer to a bowl, add water to cover, and set aside until ready to cook. Heat the oil in a large nonstick skillet. Drain the potatoes, pat dry with paper towels, and add to the hot oil. Saute over high heat for 12 to 14 minutes, stirring occasionally, until the potatoes are browned on all sides. Meanwhile, chop the garlic and parsley together until finely minced. Add the salt, pepper, and parsley mixture to the potatoes in the skillet, tossing to combine, Serve. Whisk together the vinegar, salt, pepper, and yoghurt in a bowl large enough to hold the lettuce. Whisk in the oil. Add the lettuce to the dressing and toss until coated. Sprinkle on the fresh herbs and serve immediately. This delicious pork stew recipe is from Martha Stewart's cookbook, One Pot. Potatoes and Rosemary is one of the four variations that was given in the book. There's 2 whole cups of red wine in the stew, with 2 cups of chicken stock. I have added about a cup of cooked black-eyed beans. Did not have any fresh button mushrooms, so I"ve used canned ones instead. The two sprigs of rosemary are from my garden pot. The pork pieces are first browned in a little oil, then remove and transfer to a plate. The onions, mushroom, pepper and rosemary are sauteed in a little oil until the onion softens, then stir in flour and cook for a minute. Add the red wine, bring to a boil, then add the chicken stock and the pork. Simmer until pork is tender, about 1 hour 15 minutes. If the gravy appears to have reduced a lot, add some water or stock. The potatoes, (canned mushrooms and beans) are added in, continue to simmer until the potatoes are tender. The stew smells so good while braising in the Dutch oven. This stew is so delicious. Soft tender pork full of flavour, with tender potatoes and beans. The gravy is so flavourful and tasty. 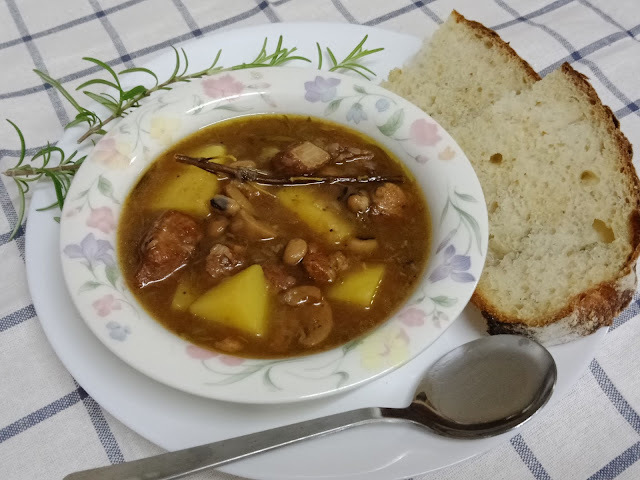 We had this stew for dinner with my homemade Roasted Garlic and Rosemary Sourdough Bread, so good to mop up every last drop of the gravy! Season pork with salt and pepper. In a small Dutch oven, heat 2 tablespoons oil over medium-high. Working in batches, add the pork and cook until browned, 5 to 7 minutes. Transfer to a plate. Add remaining tablespoon oil, the sliced onions, mushrooms, pepper and rosemary, cook for 7 minutes. Stir in flour and cook for 1 minute. Add the red wine and bring to a boil for 1 minute. Add the broth and pork, and bring back to a boil. Reduce to a simmer; cook, partially covered, until pork is tender, about 1 hour and 15 minutes. Add the potatoes, (together with the canned button mushrooms and the cooked beans, if using) and return to a boil. Reduce to a simmer, cook, partially covered, until the potatoes are tender. Stir in parsley, and season with salt and pepper. This is a lovely bread, with flavours from soft fragrant roasted garlic and the scent from fresh rosemary. I've increased the chopped fresh rosemary to triple the amount, to 3 teaspoons, and reduce the salt to 1 teaspoon. 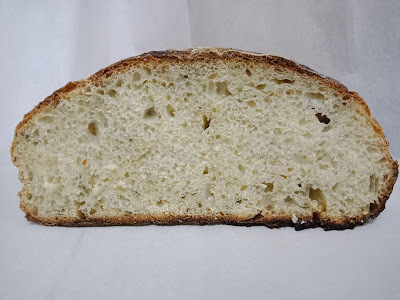 With soft close crumbs, we enjoyed this bread with a bowl of pork stew. Yummy! This recipe is from Emilie Raffa's book, Artisan Sourdough Made Simple, and can also be found at this link. This month's selection at Cook the Book Fridays where we are currently cooking from Everyday Dorie, is Potato Tourte. It is a double-crusted pie, with potatoes, herbs and cream for the filling. A couple of things which I've simplified, is to zest the lemon using the microplane zester. In the book, Dorie says to use a vegetable peeler to remove the zest, then slice into the thinnest strands. Seems like an extra work for me (I'm lazy! ), so I use the microplane zester instead. For the potato, they are to be sliced very thinly, then drop into a bowl of cold water, drain them and dry them well. I skipped the water and the drying part (told you I am lazy!). I sliced the potatoes using a sharp knife and use them directly. The herbs I've used are a combination of cilantro and scallions. I made 4 mini pies instead of one 9-inch pie. I constructed the pies (Dorie says this pie is a construction project) the evening before, keep refrigerated, then the next morning, brush with egg wash and bake. 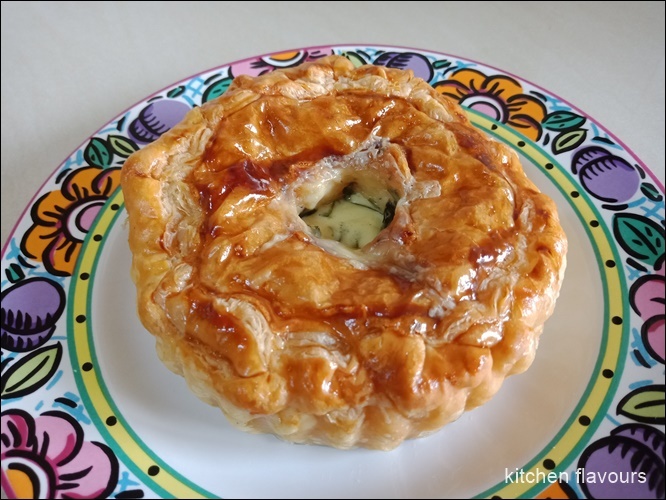 The pies are baked for 30 minutes, then pour some warm heavy cream into the vent hole at the top, then bake for a further 20 minutes until the potatoes are tender. Let the pie sit for about half an hour before serving. Yum! Yum! So delicious! 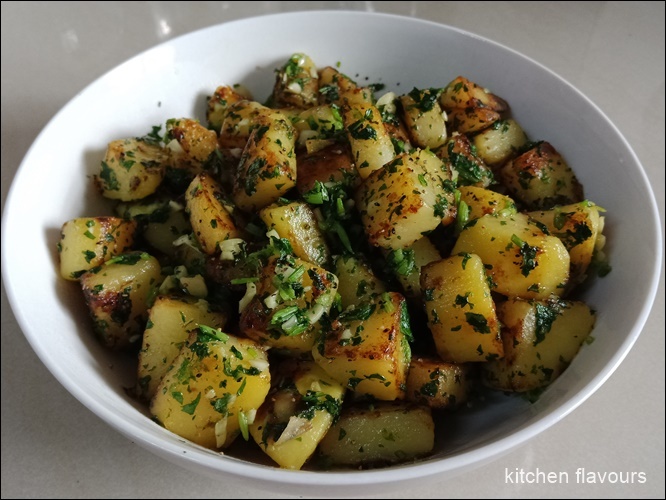 The potato are tender, so tasty with the herbs and cream. 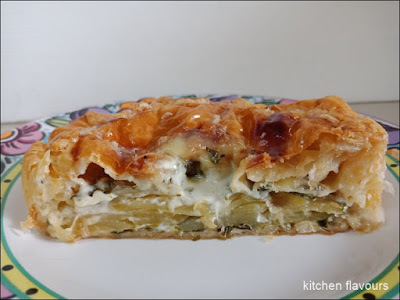 Another keeper recipe from Dorie! 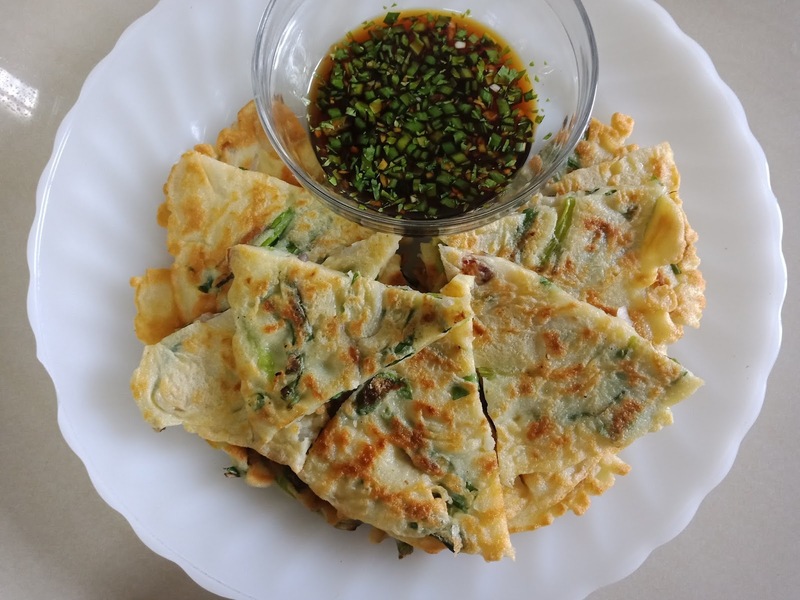 Harvested some spring onions from my garden pot to make these Scallion Pancake (pajeon). This is one of the snack that we would sometimes order when eating out at Korean restaurant. I've added a medium onion, peeled, cut in half and sliced very thinly into half-moon slices. Served with spring onion dipping sauce. These pancakes makes for a perfect light lunch. Yum! In a medium bowl, mix together all of the ingredients except for the vegetable oil, and let sit for about 10 minutes. Check the consistency before cooking. The batter should be little bit runnier than American pancake batter, so the pajeon cooks quickly and evenly. Heat a medium skillet over medium heat and coat with a thin layer of vegetable oil. Pour the batter into the skillet, coating the bottom of the pan in a thin layer (about one-third of the batter should fill a medium skillet). Cook for 3 to 4 minutes, until the batter is set and golden brown on the bottom. Turn over the pancake with help of a spatula or plate and finish by cooking 1 to 2 more minutes, adding more oil of necessary. Transfer the pancake to warm plate. Repeat, to cook the remaining pancakes. Before serving, cut into triangles (like a pizza). Serve with seasoned soy sauce or spicy dipping sauce. I've used my favourite dipping sauce from another cookbook, the recipe can be found here. A simple, stir-fried greens using one of my favourite vegetable, cabbage. 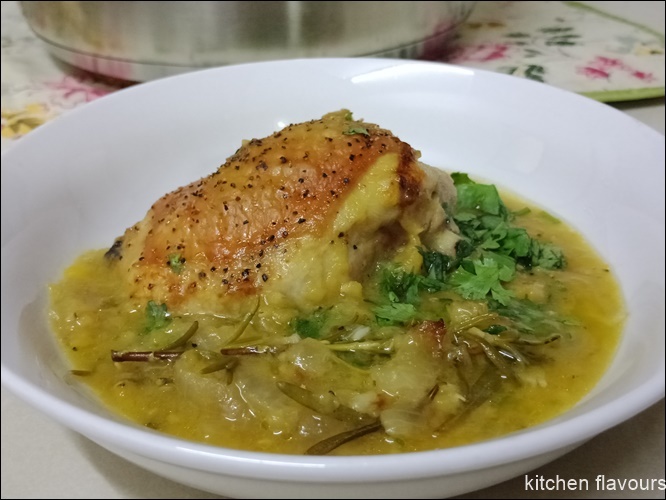 This is one of the stir-fry cabbage dishes that I sometimes cook at home and was pleasantly surprised to find this similar recipe in Every Grain of Rice cookbook. The dried shrimps added an umami fragrant taste to the dish. This stir-fried cabbage dish makes an excellent side dish to rice meal, and is great with plain congee. Discard any fibrous outer leaves and cut out and discard the thick stem of the greens. Shred the leaves. Cut the spring onion greens into thin slices. Add 3 tbsp of the oil or lard to a seasoned wok over a high flame and swirl it around. Add the shrimps and stir-fry until crisp and fragrant. Remove the shrimps from the wok and set aside. Return the wok to the stove with the remainder of the oil or lard, add the greens and stir-fry over a high flame until hot, barely cooked and still a little crisp. 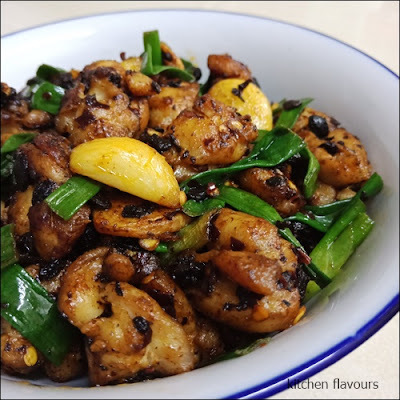 Return the shrimps, adding the soy sauce and salt to taste (you may not need any salt because of the saltiness of the shrimps and soy). Finally add the spring onions, stir a couple of times, then turn on to a dish and serve. One of my favourite dish from Fuchsia Dunlop's cookbook, Revolutionary Chinese Cookbook. Made this dish a few times already. The recipe uses a whole head of garlic, fermented black beans, ginger, rice wine, rice vinegar, chili flakes and soy sauce. I've used boneless chicken thigh without the skin. Scallions are picked fresh from my garden pot. 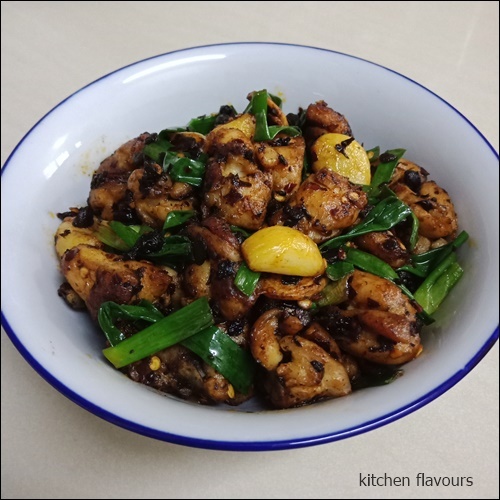 The chicken pieces are stir-fried until they change colour, remove and then fried second time until they brown a little. The chicken are then removed, and stir-fry with the rest of the ingredients. Simple and delicious, great with white fluffy rice. Cut the chicken into bite-size chunks. Put the chunks in a bowl, add 1/4 teaspoon salt and the soy sauce and mix well; set aside while you prepare the other ingredients. Peel the garlic cloves, cutting any very large ones in half. Peel and slice the ginger. Cut the scallion greens into 1-1/2 inch pieces. Heat the oil for deep-frying over a high flame until it reaches 350-400F. Add the chicken and stir-fry until it has changed colour, then remove from the wok with a slotted spoon and allow the oil to return to 350-400F. Return the chicken to the hot oil and deep-fry again until tinged golden, remove and set aside. Drain off all but 3 tablespoons oil from the wok, then return it to a medium flame. Add the ginger and garlic and stir fry for a few minutes until they are fragrant and the garlic cloves are tender. Add the black beans and stir-fry until fragrant, splashing in the rice wine as you do so. Add the chili flakes and stir-fry for a few moments until they have lent their heat and red colour to the oil. Return the chicken to the wok and toss it in the fragrant oil, splashing in the vinegar and adding salt to taste. When everything is sizzly and delicious, throw in the scallions, and stir a few times until barely cooked. Then, off the heat, stir in the sesame oil and serve.